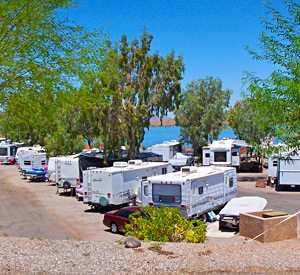 Havasu Springs Resort offers 136 full hook-up Lakefront RV sites, overlooking the majestic Lake Havasu. The RV Resort has multiple laundry & shower facilities. The whole RV Park boasts beautiful lake views, beach access, and is centrally located next to our first class fishing dock, 9 hole executive golf course and pool. Whether you enjoy boating, water skiing, wakeboarding, or fishing on the lake, Havasu Springs RV Resort is truly a watersports paradise with it’s lakefront rv sites and all the facilities and services necessary to ensure a truly great vacation experience.